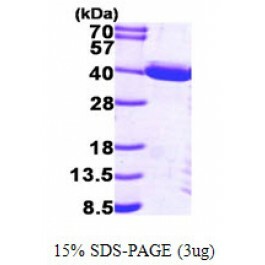 TP53I3, also known as quinone oxidoreductase PIG3, is similar to oxidoreductases, which are enzymes involved in cellular responses to oxidative stresses and irradiation. It is localized to the cytoplasm and induced in primary, non-transformed and transformed cell cultures after exposure to genotoxic agents. This protein has been suggested that the microsatellite polymorphism may be associated with differential susceptibility to cancer. Flatt PM. et al. (2000) Cancer Lett. 156(1):63-72. 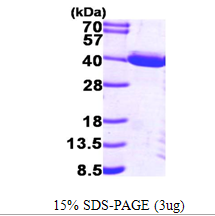 Recombinant human TP53I3 protein, fused to His-tag at N-terminus, was expressed in E.coli and purified by using conventional chromatography techniques.